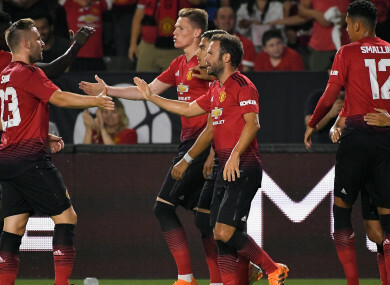 MANCHESTER UNITED ENJOYED a winning start to their International Champions Cup campaign after surviving a penalty shoot-out 9-8 against AC Milan. Franck Kessie chipped a spot-kick over the crossbar to finally hand United victory after 26 penalties, following a 1-1 draw in Pasadena, California on Wednesday. Milan twice had the opportunity to prevail after Pepe Reina saved three successive penalties, including one from United counterpart Joel Pereira, but the Red devils eventually triumphed in a marathon. United made a dream start at the Rose Bowl when the refreshed Sanchez broke the deadlock in the 12th minute. Having struggled following his high-profile arrival from Arsenal, Sanchez – who enjoyed an extended break courtesy of Chile’s failure to qualify for the World Cup – scored with a tidy finish past Gianluigi Donnarumma. Jose Mourinho, however, was left visibly frustrated after United conceded three minutes later – a ball from Leonardo Bonucci picking out Suso with ease. Both teams enjoyed chances to win their ICC opener but neither side could make the breakthrough in regulation time as United prevailed on penalties. Bonucci has been tipped to complete a sensational return to Italian champions Juventus but the experienced centre-back skippered a Milan side, boasting Donnarumma, Hakan Calhanoglu, Suso and Patrick Cutrone. There was no Anthony Martial for United after the disgruntled forward returned home for the birth of his second child amid growing doubts over his future. The Red Devils, though, still fielded Alexis Sanchez, Juan Mata, Ander Herrera, Eric Bailly, Luke Shaw and out-of-favour Matteo Darmian, who surprisingly wore the captain’s armband in Antonio Valencia’s absence, despite being linked with a transfer. Herrera almost put United ahead in the third minute, but Donnarumma got down low to tip away the shot. But the Red Devils did hit the front thanks to Sanchez nine minutes later after being played through by Mata in a swift move. United’s lead was short-lived, however, as a simple throughball from Bonucci exposed Milan’s opponents – Suso firing a half-volley past Lee Grant. Donnarumma appeared to be targeted by United, who on two occasions attempted to catch the scrambling keeper off his line with Sanchez almost scoring direct from a corner, while Mata came close with a quick free-kick after Herrera was denied by the Italian moments earlier. Sanchez continued to look sharp and the Chile international’s acrobatic volley came close to restoring United’s lead two minutes into the second half. From that point, Milan looked the more likely to add to the scoring as United tired with the minutes ticking by, though the tireless Sanchez provided an outlet up front, while Milan debutant Reina made a fine save to keep out Luke Shaw’s long-range effort. Calhanoglu looped a ball over to Fabio Borini, but the substitute’s shot was tipped onto the post by Joel Pereira with six minutes remaining as the match headed to penalties. Email “26 penalties later: Man United overcome Milan after marathon shoot-out in California”. Feedback on “26 penalties later: Man United overcome Milan after marathon shoot-out in California”.